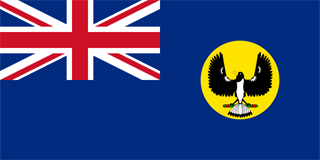 The flag of Western Australia was adopted in 1904. The South Australian flag is an adaptation of the national flag of Australia, and features a Piping Shrike with its wings outstretched on a golden disc. South Australia's coat of arms was granted by Queen Elizabeth II on April 19, 1984, replacing the 1936 version. The current coat of arms is composed of a Piping Shrike within a golden disc (representing the rising sun) against a blue shield. Above the shield is a crest of Sturt's desert pea, and the base of the coat of arms is a grassland (symbolizing agriculture and industry) with the name of the state displayed on a ribbon.